Library Home / Hours & Locations / Xwi7xwa Library / 2018 / August / 03 / Happy Pride from Xwi7xwa Library! Happy Pride from Xwi7xwa Library! At Xwi7xwa, we are proud of our growing collection of materials that celebrate the two-spirit, queer, and trans members of our communities. 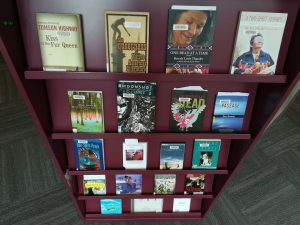 Our collection contains a range of genres and formats (including novels, memoirs, poetry, graphic novels, DVDs, and academic works) centering Indigenous perspectives on gender and sexuality. More and more of this material is being created by (rather than about) Indigenous people who identify as part of the LGBTQ2S community. Our collection features Gwen Benaway, Daniel Heath Justice, Qwo-Li Driskill, Kent Monkman, Thirza Cuthand, Tomson Highway, Sharron Proulx-Turner, Joshua Whitehead, Chrystos, and many more authors, artists, and scholars. Try searching the UBC Library Catalogue using keywords like two-spirit, queer, transgender, bisexual, lesbian, gay, or LGBT, and filtering by Location: Xwi7xwa Library. Or just come into the library to browse the shelves and check out our display!